Peter Lamprey writes saying flying continues much as before and concludes with the fact that he has heard worrying rumours about his previous employment. After the spate of correspondence you hurled at me you now seem to have struck a sterile patch. One great thing about you is your reliability. You can always be trusted to do the unexpected. Not but that life being what it is, the unexpected is practically all I get these days at that. we fly, and sometimes we don’t. When we don’t we wish we were and when we do we wish we weren’t. If they could only guess what we really wanted to do all the time life would be just fine. Still things are not too bad and I expect to find myself satisfied one day. give Harry Beachams [sic] back a rest. Since starting this epistle I have, through devious channels, heard some bad rumours about the shop so I will pack it in a get the letter away. Hope the rumours are wrong and as soon as I hear from you will write back whether they were right or not. 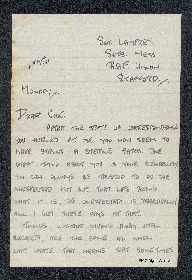 Peter Lamprey, “Letter from Peter Lamprey to W Gunton,” IBCC Digital Archive, accessed April 24, 2019, https://ibccdigitalarchive.lincoln.ac.uk/omeka/collections/document/6611.